You are here: Home » What’s up with Duane Wilson? What’s up with Duane Wilson? There’s no way to sugarcoat it. 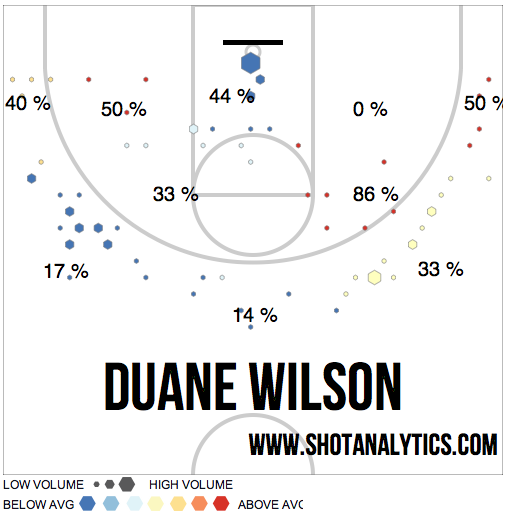 Duane Wilson is in one hell of an offensive slump. The 6-foot-3 redshirt freshman from Milwaukee was one of the biggest bright spots in the early goings of the Marquette season. He made acrobatic drives, drilled deep threes, was automatic from the charity stripe, and was an electrifying playmaker for the Golden Eagles. In the final game of the Orlando Classic, Duane single handedly put Marquette on his back and led them to victory over Tennessee by scoring a career high 30 points. Duane’s shooting numbers have decreased dramatically. None are more concerning than his 3-point shooting. The Milwaukee native has gone 1/18 from deep in the last seven games. That is a confidence crushing for even the most veteran of players. Some may point to his increased rebounding, assists, and turnovers as a balancing factor but the amount of empty possessions from a missed three or wild drive to the hoop has negatively affected Marquette more than once. It is worth noting however that Duane’s defense has increased in the second half of the season. He has much more comfortable in his role in both man to man and zone schemes and has racked up 5 blocks and 15 steals. What is causing this slump? It could be simple regression to the mean, hot starts are often followed by cold slumps. The arrival of Luke Fischer greatly changed the offensive makeup of the team, as did the departure of Deonte Burton. It is possible that the roster shakeup has negatively impacted what Duane excels at in the offense. It might be that losing teammates Burton and John Dawson may have taken a personal toll on Duane. The simple truth is, slumps happen. They happen to freshmen a lot. Duane Wilson will be fine. He shouldn’t be expected to return to the 14 ppg he was scoring in the first half of the season, but his scoring efficiency should return to acceptable levels. In the meantime, Wojo may consider increased playing time for Jajuan Johnson or Sandy Cohen. The latter of the two has been on quite the tear in his last four games. Sandy Cohen is 9/12 (.750) from the field and 6/9 (.667) from three since the Alabama A&M game. He’s a Student-Athlete. There is nothing he “better” do except try his best. He’s not your employee.